Bali is an island in Indonesia located at the eastern end of Java. This island is often described as “heaven” and with a very good reason. The combination of friendly and welcoming people, visual culture filled with spirituality and spectacular beaches make Bali a dominant tourist attraction and a treasure of Indonesia. With approximately 20.000 Hindu temples on the island, they become the best-known attraction in Bali. There are at least three temples in every village, even in the smallest ones, but nine of them named Kahyangan Jagat stand out and are the largest and most important. Uluwatu, in the southern part of Bali can be easily reached, and it’s the most popular temple, with Tanah Lot immediately after it. For the locals the “mother temple” is Besakih located on the slopes of MountAgung. Uluwatu is a little village on the west coast, south of Jimbaran, and the largest number of tourists associates this place with the famous temple of the same name, which is located a few kilometres south. Uluwatu temple is one of the biggest cultural attractions of Bali and is a place of great importance. Even more eminent than the Themple is its location – standing out on the ledge, 70 meters directly over the ocean’s waves. There are sudden and steep promontories on both sides that make the scenery in this place unique and an exceptional experience for everyone. In central Bali, 33 kilometres from Kuta, you can find the town Ubud that is best known as the centre of arts and crafts. More than half of the city is consisted of art workshops and galleries, which mainly make cheap reproductions for tourists, but sometimes you can spot a work that is a true masterpiece. Tirta Empul (one of the most sacred temples in Bali, built around hot springs). In the territory of Bali, you can find several hot springs. One of them, surrounded with beautiful gardens is Air Panjar, where the hot water runs through steep cliffs and reaches the natural pools. The spa lovers can find all sorts of relaxing treatments. The most popular is Lulur body scrub done with herbs and spices, which traditionally is performed before weddings. The massages are usually made with oil and include long hedonistic moves. One day spent in some of the spas in Sanur, a small town on the island’s eastern side, and you’ll feel like a new person after the full spa treatment service based on Bali’s tradition. If you visit Bali, enjoy the opportunity to indulge yourself in the spa treatments as the prices are more than welcoming – you will pay only half of what you would have to pay in North America or Europe. Warm waters and low prices put Bali at the very top of the surfing destinations. The sand beaches and the lack of dangerous rocks or coral reefs, make the area extremely attractive for both beginners and more advanced surfers. You will find surfing instructors chilling on the beach that provide surfing lessons for $45. 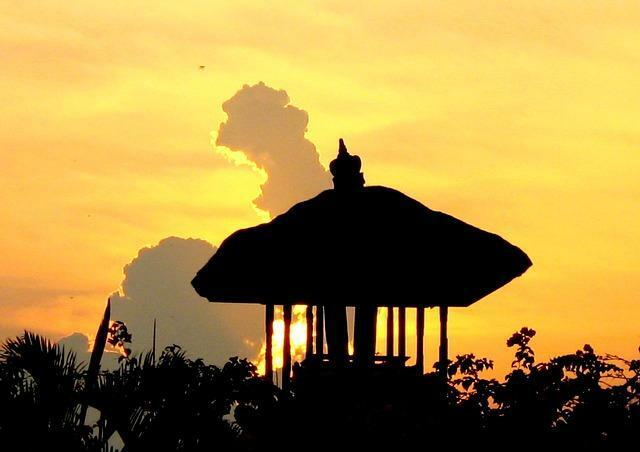 Namely, Kuta and Nusa Dua environment are the primary “peaks” for this purpose. Seminyak is one of the best high-end markets on the west coast, with superior accommodations and cutting-edge restaurants and bars that serve residents and tourists. Seminyak has more casual and rural atmosphere than Kuta, and during the day, you can spend much quieter moments at the beach. PetitengetBeach is a beautiful sacred area just around the temple, but here sunbathing is not allowed. Here, the sunsets are known for their magnificent beauty. You can find a number of different cafes and restaurants that serve Indonesian and international cuisine. Our suggestion is to visit the smaller local restaurants first because they offer better and cheaper food. Bali is always hot, moist and tropical. The dry season lasts from April to October, and the rain season from November to March but these guidelines are quite relative. The tourist season is the most important, and the best months for visiting this place are July and August, and again in the end of December from Christmas to New Year. This would be the best period to visit Bali for an unforgettable vacation and relaxation. M. Pandzarova is a graduated philologist of Polish and Spanish literature and culture, free-lance translator, professional marketing and media research, explorer and huge travel enthusiast. Editor-in-chief of the travel blog Forget Home where you can find all sorts of interesting articles about travel, nature and photography.